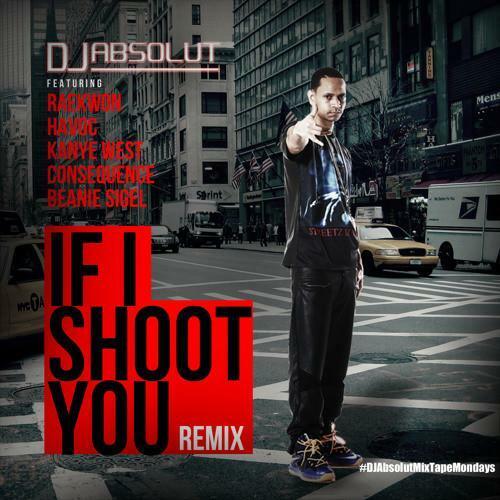 DJ Absolut has been teasing his "If I Shoot you" remix for years, with various versions of the track showing up on an array of mixtapes. Today, he's shared a fully mastered version of the track with verses from Raekwon, Havoc, Kanye West, and Consequence(Beanie Sigel is listed on the art, but we're not hearing him). The hook riffs on the opening lines of Jay Z's classic track, "Streets Is Watching." Yeezy unfortunately doesn't get a verse, but he does throw down on the hook. Everyone else kills it, with Raekwon opening things up with a memorable 16 and Cons coming through with some College Dropout flows. It's unclear whether the track has been stitched together by Absolut, but if so, he did a pretty good job.